Sugar cookies are one of my favorite kids in the kitchen recipes. Getting to cut the cookies and then frost and decorate them with sprinkles once they are cooled really gives them a sense of ownership. My niece and nephew made this particular batch with a little help from me. I mainly manned the parts that they couldn’t do like run the mixer and actually bake the cookies. I also made the frosting because I didn’t want the kitchen to look like January from powdered sugar. Sugar cookies with colored icing and sprinkles. Perfect to let the kids in your life help you make. In a large bowl cream the shortening and sugar until fluffy, scraping down sides occasionally. Add the egg and vanilla and beat until fluffy again. Pour in milk and mix well. Stir dry ingredients together add to the bowl and mix. Chill for 2 hours or longer. Preheat oven to 375 degrees. Spray cookie sheets with baking spray. Roll out dough on flour covered surface to between 1/8 and 1/4 inches thick. Cut with desired cutters, we used stars and flags. Place on prepared sheets and bake for 6-8 minutes. Cookies will still be pale. Cool on sheet for 2 minutes then transfer to rack. Hey Micha! 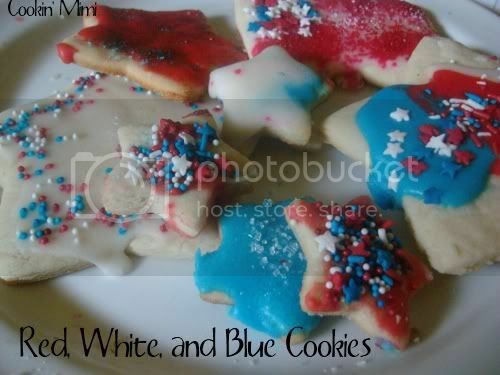 I would love it if you could link it up on my “4th July treats” Linky! Very pretty & yummy, too! Wish I had one to go with my cuppa tea right now.